Mercedes-AMG is celebrating a victory in the Formula 1 Championship 2015 by launching a limited edition version of A45 car called Champion Edition. 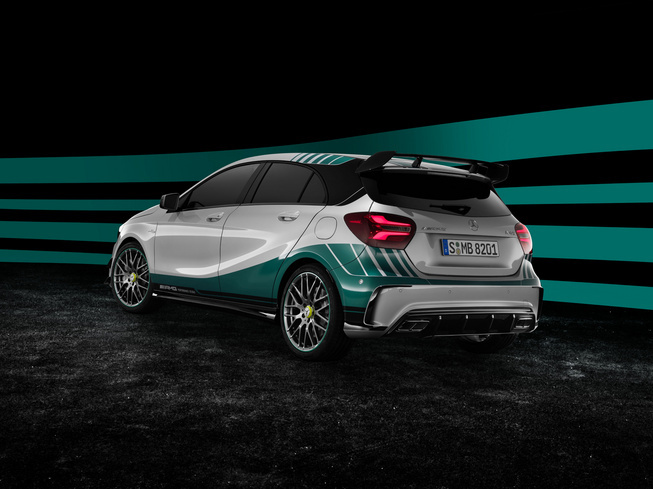 As reported by the Leftlanenews, the Champion Edition car comes in a silver color blend, black, and green, as well as additional bumper, sporty spoiler and equipped with four 19-inch size wheels. 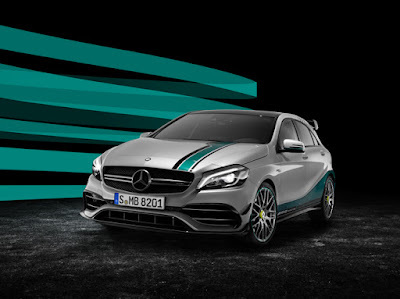 The A45 Champion Edition version is powered by a 2.0-liter four-cylinder engine combined with a turbocharger could generate the power up to 381 hp and torque of 350 lb-ft.
All Champion Editions come loaded to the gills with equipment such as the AMG Dynamic Plus Package, which bundles a mechanical locking differential on the front axle, and an adjustable sport suspension with a race mode. Those numbers of power could drive all-four wheels through a seven-speed automatic transmission, thus making this car can take zero to 62 mph in 4.2 seconds and reach an electronically limited top speed at the numbers of 155 mph.